One of the key features of Dub parking site is its ability to attract visitors through its contents, but also to have them return to your site. This is difficult, but also very important for your domain (or any website really). A visitor may come to your domain once, leave and never come back. But if they find your domain and its content interesting, you might be able to have them come back to your site. If they do come back often, then you also have someone who is quite interested in your site and you have a far better chance should you ever decide to sell your domain in the future - you now have a potential customer who is interested. Dub parking site comes with this membership feature out of the box. Visitors who are interested in your site can automatically create an account on your site, using email & password or via one of their social accounts. Dub also has a built-in 'registration confirmation' feature, so that your site is not spammed by invalid user accounts. Once a visitor registers, the member can now do several things on your site which a non-reigstered visitor cannot do. They can now vote up/down on posts, like them and also even be able to submit a post. Your parking site will also send out an automated newsletters to your members to keep them updated on the latest posts that are available to your site, so they can come back. 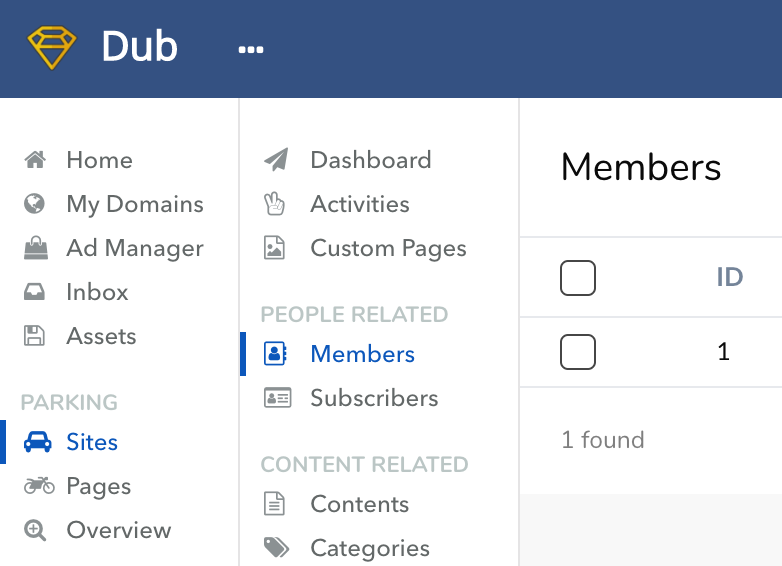 Members can be managed via your Dub's admin panel. You should see "members" menu item on your site as displayed in the screenshot 1 below. All basic management of members such as deleting and editing are all available through this page.